Sales growth up slightly from 2016; Intel, SK Hynix, Toshiba and Western Digital lead the pack. 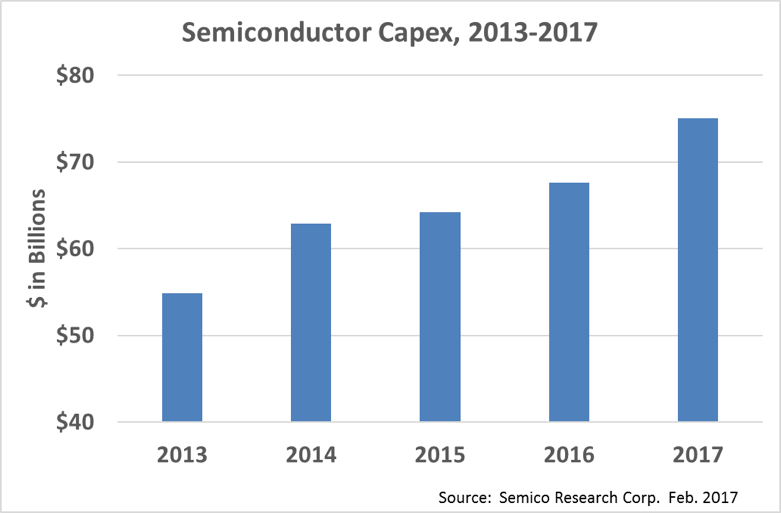 Semiconductor capital expenditures are an important bellwether for the industry. Based on preliminary findings, Semico Research predicts 2017’s total will increase 4.3% to $69.7 billion, a record high, and a slightly larger increase than in 2016. Semico tracks more than 80 companies for CapEx and R&D spending, although many of those companies have merged, have been acquired, or gone bankrupt in the 15+ years we’ve been tracking this data. One that’s consistent is that the top 10 spend about 80% of the total amount each year. Some of the companies contributing to the increase include Intel, SK Hynix, and Toshiba and Western Digital. Intel made big news by increasing its CapEx by $2.4 billion from 2016. Intel’s CapEx is expected to increase 25% over 2016, from $9.6 billion to $12 billion, in 2017. The company recently announced plans to complete Fab 42 in Chandler, Ariz., after putting it on hold since 2014. Fab 42 will produce 7nm technology, although no specific timelines for opening were mentioned. More than $7 billion will be spent on the fab over the next three to four years. As recently as June 2016, Brian Krzanich was quoted as stating that $9 billion in annual CapEx was “about the right number”, so it is interesting that seven months later the amount had risen by $2.5 billion. In the January 2017 earnings call, an executive alluded to building a new pilot line in 2017 for 7nm development. The company clearly made the decision to greenlight Fab 42 sometime in that seven months. Breaking down that $12 billion number, Intel’s memory CapEx will grow from $1.6 billion in 2016 to $2.5 billion in 2017. This means that memory accounts for $900 million of the $2.5 billion increase. The rest of the increase is going to bring 10nm capacity online and build the 7nm pilot line. After Intel, the next largest spending increases are coming from Western Digital and Toshiba. The companies plan to ramp 64-layer BiCS3 NAND during 2017. In 1Q17, they will break ground on Fab 6, which will support the conversion from 2D NAND to 3D NAND capacity. Fab 6 is planned to begin operating in 2018. Keep in mind that 3D NAND capacity requires a substantial amount more capital investment than did planar NAND. Toshiba recently announced its intention to spin off its NAND and SSD business into a separate company. The company expects to have the details of the split worked out by the end of February, and the effective date of the split is planned for March 31. Toshiba has been dealing with financial scandal since 2015. Earnings were over-reported for seven years, and Toshiba’s nuclear business has been tied in part to this problem. Other memory companies are among the largest spenders as well. SK Hynix will increase its spending in 2017 for NAND, as they plan to install a new cleanroom in M14 to increase capacity as well as develop and mass produce 72-layer 3D NAND. Samsung has not announced its guidance yet for 2017 CapEx, but it will be preparing for NAND production at the Pyeongtaek campus by mid-2017. They are focused on the migration to 64-layer VNAND. For DRAM, Samsung is not increasing capacity, but will use the remaining space on Line 17 to offset the standard capacity decline as they move to 1x nm. Finally, Micron’s 2017 CapEx will be down about 13% for the calendar year, after a 17% increase in 2016. The company has achieved bit crossover on 20nm DRAM, and it is deploying 1xnm. These have been significant shrinks for them, so they have no plans to add new DRAM wafer capacity in FY 2017. It has begun production of Gen Two 64-layer 3D NAND, and expects to ship 3D XPoint for revenues this year. Other companies in the top 10 are the foundries. Major foundry CapEx will be flat to down from 2016 to 2017. This includes TSMC, UMC and SMIC. One outlier is GlobalFoundries, which recently announced plans to increase capacity at its existing fabs, and also build a new 300mm fab in China in a joint venture with the city of Chengdu. The Chengdu fab is expected to begin production in 4Q18. Overall, 2017 will be another positive growth year in semiconductor capital spending, with several large projects to keep our eyes on. For more information about Semico Research’s offerings related to CapEx, R&D spending, market shares, wafer demand, and fab tracking, please contact at [email protected] or visit us at https://semico.com. Rising costs and a shrinking customer base make the leading-edge business difficult, but the overall chip market is growing. Outlook strong for some sectors, tepid for others. Consolidation, rising costs of development could take a toll. Political uncertainty, tempered optimism, continued consolidation, and concerns about capacity. Why adding power management and control is so critical in complex SoCs. Adrienne Downey is director of manufacturing research at Semico Research.